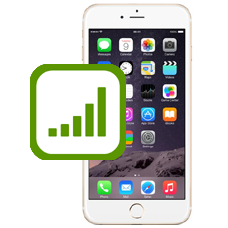 iPhone 6 Plus no service signal fault repair. We provide board level repair services for the iPhone 6 Plus with cellular signal or GPS signal faults. Does your iPhone 6 Plus have no signal bars but still connects to the mobile cellular network or maybe displays No Service in the status bar? This issue is usually a hardware fault assuming the handset is not network IMEI blocked or reported lost or stolen. If your iPhone 6 Plus displays any of these symptoms we can usually repair this hardware fault. If you have problems getting a GPS signal lock in apps, we can also repair GPS faults on the iPhone 6 Plus for you with this repair service.